Micro-computed tomography (microCT) is an imaging technique that uses x-rays to produce cross-sectional images of an object that can be reconstructed to create a three-dimensional model. It allows for non-destructive quantitative analysis of the density, geometry and microarchitecture of mineralized or high-density material, particularly bone and biomaterials stained with contrast chemicals. The reason the technique is called micro-computed tomography is that the pixels are in the micrometer range; much smaller than conventional clinical computed tomography (CT) scanners. However, with an increase in resolution comes a decrease in the field of view that can be imaged. 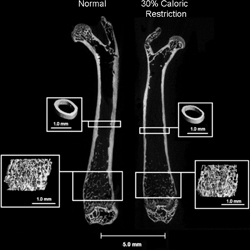 This means that microCT can only be performed on small specimens such as human biopsies or animal bones. Additionalhttp://www.bouxseinlab.org/publications/2009-2011/Bouxsein_2010_JBMR_CT%20Guidelines.pdf information on the specifications of our system can be found on the Scanco website. If you are interested requesting microCT services or collaborating, please contact Mary Bouxsein or Daniel Brooks. If possible, please fill out and include the CAOS MicroCT Requisition form and the Sample Assignments form, which are found below. These forms request contact information, project details and specimen information. We are also able to prepare your specimens if it is helpful to you. This includes dissection, removal of requested bones, and preservation of bones. We typically use the femur, tibia and/or lumbar vertebrae for scanning and analysis, but we are able to remove and scan any bones at your request. We are able to work with specimens that are frozen, or fixed in ethanol or formalin.